Sabourin, Diane. "The Huron-Wendat Museum". The Canadian Encyclopedia, 29 November 2016, Historica Canada. https://www.thecanadianencyclopedia.ca/en/article/the-huron-wendat-museum. Accessed 25 April 2019. Located in the heart of Québec City on the Wendake Reserve along the Akiawenrahk (Saint-Charles) River, the Huron-Wendat Museum highlights the history and culture of the Huron-Wendat nation. 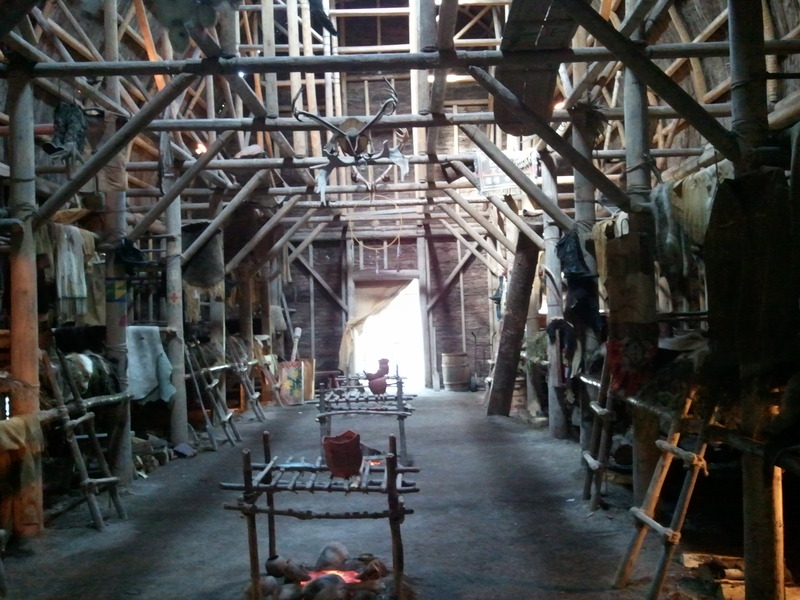 Reconstructed Huron Wendat longhouse at Huron Wendat Museum in Wendake Québec take July 2012. Inaugurated in 2008 and considered a national institution of the Wendat nation, the Huron-Wendat Museum allows visitors to come into contact with the ancestral customs of the community. Even before entering the building, its conical shape reminds us of an Indian smokehouse and its structure is like a truncated stockade, the symbol of peace and tolerance. The museum opened its doors in March 2008, and in 2009 was awarded a Prix d'excellence from the Société des musées québécois (Québec Society of Museums). The main permanent exhibit covers three main themes: territories, memories and knowledge. This interactive exhibit leads us to discover a rare collection of ancient objects and puts visitors in direct contact with the Wendake culture. The objects in the Huron-Wendat collection were gathered over a period of more than 40 years by the band council and consist of costumes, furniture, textiles, jewellery and much more. On the ground floor of the museum, temporary exhibits offer visitors more in-depth knowledge not only about the Huron-Wendat culture but of all First Nations peoples. These diverse exhibits are in various forms, both artistic and ethnological. The museum has an educational mission and invites students to various workshops and activities to help them better understand and appreciate the First Nations. The Huron-Wendat Museum invites us on a genuine cultural journey of discovery about the wealth of this nation.